Extra High Voltage (400kV, 500kV, 765kV and above). With technical support of Iselfa Morsetteria and Wise Control, this Indian plant is highly competent and qualified manufacturer of Hardware Fittings and Accessories for EHV Transmission Lines of 400kV, 500kV, 765kV and above ratings. Manpower at this plant comprises some of the best available talent in India. The business team has rich experience of many years in the fields of engineering, design, testing, manufacturing, quality assurance, business development and management processes etc which gives it the desired cutting edge in managing product quality, delivery, and customer satisfaction in technical and commercial matters. Its plant uses modern testing facilities and has been certified in compliance with ISO 9001:2008 standards. 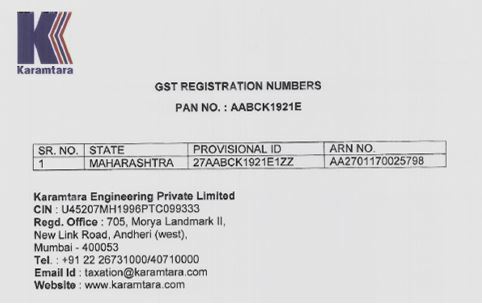 Karamtara has also set up a state-of-the-art Hardware Fittings and Accessories Plant in India in Tarapur (Maharashtra). Its Plant uses modern testing facilities and has been certified in compliance with ISO 9001:2008 standard.